Solar chargers are quite awesome when you need to charge your phone anywhere you are. As long as the sun comes up, you will have a way to recharge your devices with a solar charger. Carbon is not your average solar charger. It is a wearable device that you can take with you everywhere you go conveniently. It is capable of charging iPhone and Android devices. You can wear the Carbon like a smartwatch. 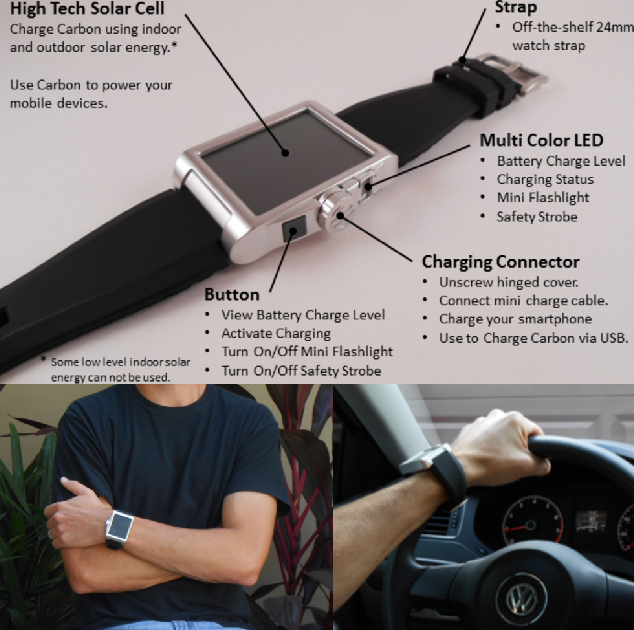 It can be charged with sunlight or a USB connection. Carbon can be charged indoors and outdoors. It has a multi-color LED to show battery charge level and status. Unlike many other solar chargers, Carbon actually looks pretty decent. This exciting product provides you with extra hours of talk or web browsing on the go. You can support the project on Kickstarter.